Steam is having a special 2009 Holiday Sale, with some ridiculously low prices on great games for the holidays. It's a couple days before Christmas, everything's under control and you've finally got a few minutes to yourself. But you're also broke, because you blew all your hard-earned money buying crap for other people. What to do? Hook yourself up with some stupidly cheap videogames, courtesy of the guys at Valve! There's a huge pile of stuff on sale and most of the price cuts are pretty drastic. 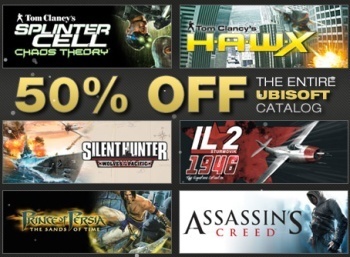 All Ubisoft and THQ games are currently half-price, while the entire catalog of Atari games on Steam is 66 percent off. Valve is also offering some amazing one-day deals, including Grand Theft Auto IV for $7.49, Mirror's Edge for $4.99 and S.T.A.L.K.E.R. : Shadow of Chernobyl, available for only $1.99. $1.99 for one of the finest shooters to come out in years! There are way too many good deals to list and prices are all over the map, so even if your budget tops out at five bucks, there's still a big pile of titles to choose from. The Steam Holiday Sale is on now and runs through January 3.